Will we ever see dry weather again in Atlanta? This morning was another one of those mornings where the humidity about knocked me out. You may find this hard to believe, but I’m trying to live my life under the concept that it’s the only one I’ll ever have so I better enjoy it. With the fresh(ish) loaf of bread I brought to work I knew that there would be a sandwich in my lunch future. I’ve had a pack of salami just waiting for a decent loaf of bread, and when combined with some Baconnaise a fine sandwich it was. Hello salami sandwich. Good-bye Meatless Monday. After work I drove down Buford Highway for another night of suds and sandwiches, except last night it was suds and half-sandwich and small pho. Sure last night’s splurge for a $6.50 dinner doubled my normal meal budget but I was definitely okay with this. The meal was far more than a person desiring to lose weight should consume, but daaaaamn it was good. The Bahn Mi I purchased was a bbq chicken, and the pho was beef. It wasn’t only because that this van was poorly parked. 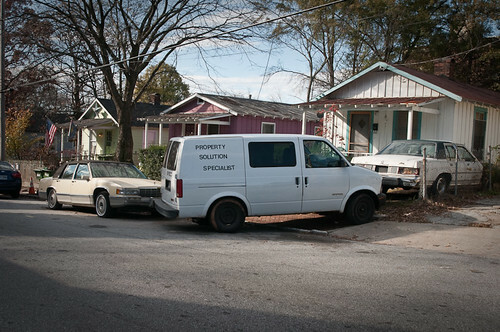 It was because this van labeled “Property Solution Specialist” was poorly parked. This is definitely a property solution with which I cannot agree. I started writing this space five years ago never intending for many people to read it. Over the years my readership had grown to about 110 or so readers a day, with many lively conversations in the comments. Over the past month or so the readership is down and the commenting has dwindled as well. I know that I’ve been busy (as I am today) thus the content has not exactly been stellar. But, I’m also cognizant of the fact that blogging has faded in popularity thanks to outlets like Twitter and people are busier than ever, which may explain the drop. Even if the readership returns to zero I plan to keep airing my grievances (it is Festivus season after all), but I’m genuinely curious if there is something that I do in order to keep this space entertaining. Website Of The Day – Given the photo I uploaded yesterday I should have used Bread.com as yesterday’s WotD but didn’t think of it. So I’ll use it today. – Earn at least $150 through photography sales in order to cover the cost for the renewal of the Jalapeño Beach SmugMug account I opened the other day. Okay this may not be the type of feedback you are looking for but…”board”? Is that a play on words? Some deeper meaning I just don’t get? Otherwise I agree with all of today’s secrets. Are you taking your car to see Lam this week? Just let me know, its really slow around here this week, probably will be until after the first of the year. Hey, so on Saturday, Jerry and I are going to try out the new CrossFit gym in Grant Park…its not bootcamp so I feel okay asking you if you want to go. BTW tomorrow if bring a friend day at bootcamp if anyone is interested. I’m not 100% sold on CrossFit but I figure its worth checking out. “board” should have been “bored”, my bad. I *may* be taking the car to Lam tomorrow. I’ll let you know. I have an incredibly pressing deadline this week and things planned for Thursday and Friday night so those days may be out. I’ll be in Charlotte on Saturday so no CrossFit for me. Thanks though. Wish all this rain would turn to snow! Everyone keep your fingers crossed that Cathy can finally go home today! I wish I was able to play on FB at work – it is slowwwww here right now (which is to be expected) & I’m bored. But – hey – the weatherman says it is supposed to finally stop raining for a couple days at least! I hope that is true, I’d rather not have a rainy day & night for the party at my house….. I hate cleaning enough as it is. Allan didn’t make it to Piedmont yesterday to see Cathy – though he thought me might after a call to Cheesecake Factory for a lacerated finger. I mean, come on, you cut your finger & called 911? Allan said it was a bad cut, but not that bad. I guess the guy wants to be sure to have a good workman’s comp claim, so he wanted to go in the ambulance to the hospital. What is your grievance-reading target number? Maybe because of Xmas people are taking a break from your grievances. There is no floor for grievance airing. Hell, it was the desire to blow steam after my car jacking five years ago that started this blog. I’ll continue to air my accomplishments too when they occur. We love you man… sorry some of the commentators have dried up. Sal may be partially right- where I used to always read the blog early in the morning, now I check in on people via FB, then get busy doing my job (dangit!) and then forget to go check in. I’ll try and do better… maybe even crank up the snark-o-meter to see if I can stir up some trouble. Your blog has just recently (this semester) been banned by my school server for “adult content” which is why I don’t read and comment as regularly. I’d like to know which of your entries set off the spammer because I was able to read last year with no problem! Guess I need to get an Iphone ….